The city of Miami, Florida, is said to have one of the highest violent crime rates in the United States. This means there is plenty to keep the team of detectives and forensic analysts on “CSI: Miami” busy. Using a combination of traditional detective methods and science, the team solves a wide range of crimes from murders to robberies to counterfeiting schemes, and all of it in the spicy Miami heat. The many different social and cultural strata of Miami are explored and the city’s dark underbelly gets full exposure. No matter how confident criminals might be in their ability to get away scot-free, the CSI: Miami team won’t make it easy for them. The team is led by the soft-spoken, no-nonsense Lieutenant Horatio Cane, who embodies the ideal qualities of both of a scientist and a hard-boiled detective. Don’t be fooled by Calleigh Duquesne’s pretty blonde looks or her petite size. She’s a ballistics expert with a steel-trap mind. Detective Ryan Wolfe uses his obsessive-compulsive disorder to his advantage, making sure that all the evidence lines up. Eric Delko is the team’s fingerprint specialist and also has expert knowledge of identifying narcotics. He is also adept at retrieving evidence from underwater, a crucial skill to have in a town like Miami. Providing the team with assistance and a lot of old-fashioned police know-how is burly Texan Sergeant Frank Tripp. 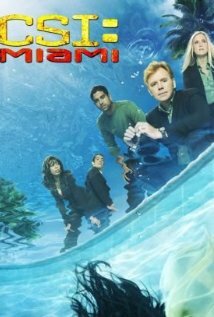 Besides the gangs, other organized crime and lone evil-doers of Miami, the CSI: Miami team also has to deal with the natural hazards of Florida itself, such as the swampy everglades, the alligators and sharks and other predators, and brush fires. Sometimes these present a threat to the integrity of evidence and make for easy disposal sites for criminals. The CSI team, however, won’t let anything stand in their way in their search for the truth and the culprits. 06 October 2008 - Season 7, Episode 3: And How Does That Make You Kill? 02 November 2009 - Season 8, Episode 6: Dude, Where's My Groom? 01 March 2010 - Season 8, Episode 16: L.A.
01 May 2011 - Season 9, Episode 21: G.O.